At Core Physiotherapy & Pilates Studio, we enjoy serving the community and supporting local charities. In 2019, we’re proud to be taking part in Melanoma March. A walk that begins at Henley Square and ends at the Grange Jetty. The Melanoma March raises vital funds and awareness of Melanoma amongst those in the local community. This also goes working towards ultimately finding a cure for Melanoma. 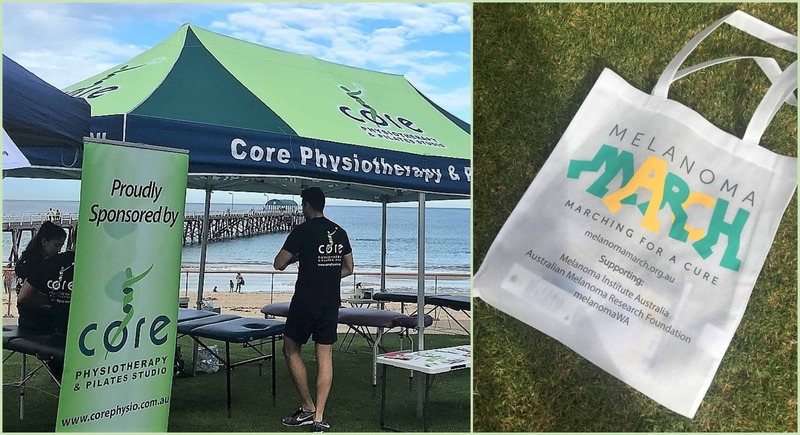 On Sunday the 31st March, we’ll have our Core Physio marquee set up at the finish line. Our Physios will be ready to massage participant’s sore and tired muscles. If you’re taking part in Melanoma March or just an avid walker, we have some Physio tips that will help you to be prepared for your walk. If it’s been some time since you took part in a long distance walk, get ready and train for the day. You can start by taking 20 minute walks daily and build up your endurance by adding 10 minutes a week. It’s not a bad idea to fuel up with energy food before you walk. Have something light like yogurt with granola or a fruit smoothie about an hour before you walk. Hydrating before you walk is important especially if it’s a hot and sunny day. Drink a couple of glasses of water up to one hour before you walk. Before you begin your walk, it’s important to warm up. Gentle lower limb stretches can get things ready to go. Focus on your calves hamstrings and quadriceps muscles. When walking, move at a steady pace. Stand as tall as you can and move your arms from side to side as you go. When taking a step, your feet should roll from heel to toe. Choose the appropriate footwear; wear durable and comfortable socks and lightweight sneakers or walking shoes. You should feel like your foot is well supported and moving in a straight line and not rolling in or out as you step. Dress to suit the weather. If it’s a warm day, wear cool, comfortable clothing. Always wear sunscreen, sunglasses and a hat. Walking in long sleeves on a sunny day can reduce the impacts of heat so give your self options to prevent heat stroke. See our blog article on how to further prevent heatstroke. Drink lots of water whilst you’re walking. It’s important to make sure that you’re armed with a water bottle at all times – especially if it’s a warm day. So that you don’t suffer from too many aches and pains, make sure that you cool down with stretches. Do this before and after your walk. Visit our Core Physio marquee at the end of the Melanoma March & our Physios will be able to give you some tips as to how you can cool down. You can also visit this link to find a location near you.